Hey this is Sensei (u should all know me from tnr). When u join this site, plz make ur username the same 1 from tnr. if u didn't, go 2 profile and change it. U can also change passwords and such here. When u join, pm me and i'll make u a mod. 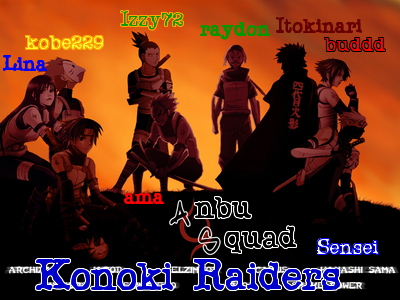 (If ur part of the ANBU Squad Konoki Raiders)Me and co-leadrs r admins. Squad members r mods. Every1 else is a member or guest. Personnaly, I don't know how anybody else should find this link. Rite now, this forum is ONLY for Konoki Raider planning. This will be our hq. i made privacy arrangements by only allowing mods and admins 2 view certain forums. Don't tell any1 outside the ANBU about this forum. If u want 2 write about something, that has 2 do with the konoki raiders or is a secret POST IT UNDER A TOPIC THAT IS UNDER KONOKI RAIDERS PLANNING! If it has 2 do with tnr as a whole, such as askin 4 help, tips, ect. u can post ur own topic. Once again, DO NOT POST INFO THAT HAS 2 DO WITH THE SQUAD, VILLAGE, OR ANYTHING THAT IS PRIVATE THAT IS NOT UNDER KONOKI RAIDERS PLANNING!